Posted on October 5, 2017 by Sara K.
While I was walking through the Indian Heaven Wilderness, a female hiker blasted past me. I was impressed by her speed, but otherwise just stepped aside and did not think much of this encounter. Then, when I reached a stream near Bear Lake, I saw her again. She was pitching a tent so she could eat her lunch. 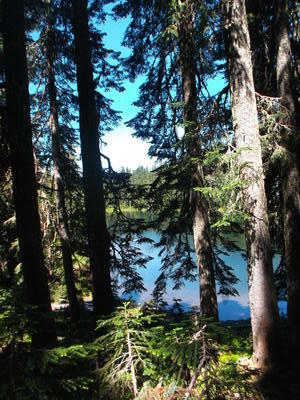 A view of Bear Lake, Indian Heaven Wilderness, Southern Washington. Indian Heaven Wilderness is also known as ‘Mosquito Heaven Wilderness’. It is notorious for having zillion mosquitoes. I kept on hearing from southbound hikers how bad the mosquitoes were. As it so happens, the mosquitoes left me alone … as long as I wore my headnet and kept moving. 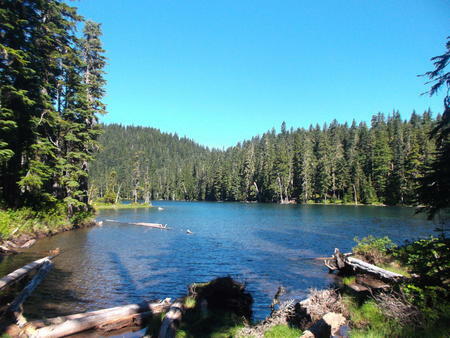 When I was at Blue Lake, there seemed to be a reprieve due to a breeze from the lake, but as I was refilling with water, the mosquitoes came back in force, so I did not have as much of a break as I wanted. No Fucks set up her tent because the mosquitoes were so persistent that she felt it was the only way she could eat her lunch in peace. I wanted a break too, but the mosquitoes would get me if I sat down, so instead I took off my pack and took a ‘dance’ break while I talked with No Fucks. I learned that No Fucks was from the Netherlands. I’m not sure whether she said she was from Vaals, or whether she had merely visited Vaals (Vaals has the distinction of having the highest elevation of town in the Netherlands). Her thru-hike of the PCT was her first backpacking experience. She says she needs to thru-hike because otherwise she would get lazy. For example, to make her goal of reaching Canada by August 16 so she could go back and finish the Sierras, she needed to hike 25 miles per day. That day, she planned to hike 30 miles, which would overshoot my planned campsite by five miles. Even though she considered 25 miles to be an ‘easy’ day, I have NEVER done a 25 mile day yet (my record is 23 miles in a day). Like many hikers, she was impressed that I carried a bear can. I mentioned that I could tell I was near a town when my bear can felt light. She said she could tell she was near a town when she COULD fit all her food in a bear can. “Hiker Hunger is real” she said. “That’s why I carry a lot of food.” (Hiker Hunger is the phenomenon of long-distance hikers having ravenous appetites). The day was not getting longer, so I moved on while No Fucks continued to eat lunch. Fast forward to when I was camped near the outlet of Big Mosquito Lake. My tent near the outlet of Big Mosquito Lake. This was a really big campsite. Near Forest Road 14, Southern Washington. I had expected No Fucks to pass me long ago since she planned to go to a campsite 5 miles beyond mine, yet I had not seen her. I pitched the tent, ate dinner, read a book, all while wondering about her. I wondered if something had happened to her. It did not help that no other hikers passed by – I hadn’t seen anybody since I crossed Road 24. Then, at 8pm, she arrives at the campsite. Since it was already 8pm, and she had completed her minimum 25 miles for the day, she decided to camp with me. It turns out that her lunch break had lasted until 4pm (I had met her at 1pm). During her lunch, all the mosquitoes formed a vast swarm around her tent, so there was no way for her to get out of the tent without a zillion mosquito bites. Then, when she reached Road 24, she noticed that she had one bar of reception on her smartphone AND that there were no mosquitoes at Road 24, so she sat down and took care of her business. That’s why it took her so long to get to our campsite. She was scratching herself all over because of her zillion bites. She was envious that I only had a few mosquito bites (because I wore a headnet and had permethrin in my long-sleeved shirt and long pants). She told me that in Oregon, the mosquitoes were even worse, and that permethrin would not keep them at bay there. “I would not have sat down and used a smartphone in Oregon,” she said “because in Oregon there weren’t even short breaks from the mosquitoes.” She said the section hikers who were in Oregon in July were fools “we thru-hikers are in Oregon in July because we have to be, but most of those section hikers did not have to be there in Oregon.” (In retrospect, those section hikers actually had good timing because they were able to hike the Oregon PCT before the fire closures). I enjoyed conversing with No Fucks before I went to sleep. I never met No Fucks again, but I kept track of her name in the trail journals, so I could see how fast she was progressing. Her journal entry at the Dismores was “It was nice to have my first shower in 20 days.” I saw in the trail register at Manning Park that she arrived in Canada on August 17, one day after her goal. Happy Trails, No Fucks. In the next part, I will write about my designated hikers of Section I: Ben & Kseniya. 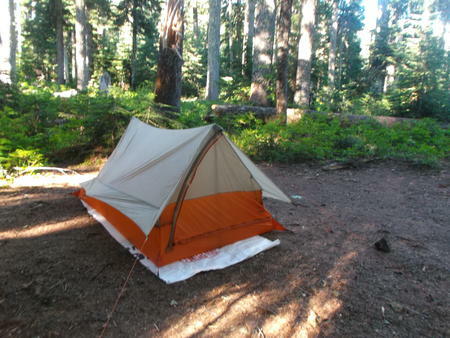 This entry was posted in Travel and tagged Pacific Crest Trail by Sara K.. Bookmark the permalink.